Newcastle United today had the official unveiling of…St.James’ Park. Newcastle United Football Club’s new sponsor wonga.com has today given the club’s fans back their home of football by reinstating the stadium’s rightful St James’ Park name. A replica of the original sign – which graced the ground for more than a century – was unveiled by Wonga, Newcastle United manager Alan Pardew, and ten lucky fans who won a local competition. The transfer is a gift to fans from the digital finance company, who last week announced they would be the proud sponsors of the club for the next four years. As well as defending the heritage of the club with the reinstated name, Newcastle United and its fans will also benefit from Wonga’s investment in the academy and the club’s foundation scheme, which helps 15 and 16 year-olds find work. The latest issue of The Mag is available now. 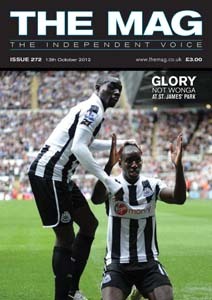 Only £3.Available online here or in all good newsagents throughout the north east.Why not subscribe? Subscriptions start from only £23. Never miss an issue and delivery direct to your home worldwide. Subscribe here in The Mag Shop.